December 14, 2017 Washington: Despite the many late night talk shows and weekend comedy sketch bits fired directly at the 45th President of the United States, Donald Trump, it appears that one bit of humor never gets old; when President Trump pulls of a masterful trolling on Twitter. For months, the #Covfefe memes and twitter handles persisted, many of which remain strong through today. It's not unlike the #Deplorable badge of honor many of us still wear proudly, however, this one had a twist. No one but the President truly knew what he meant. It seems at least one person had an idea... although it still isn't clear if this Congressman played into his own fears to introduce legislation that would actually help the president. 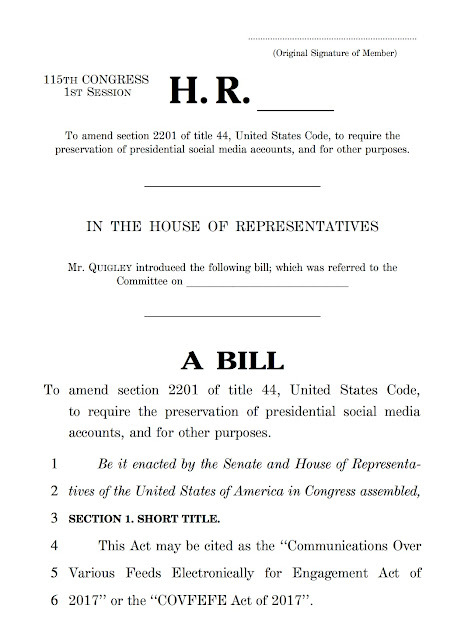 On June 12, 2017, U.S. Representative Mike Quigley (IL-05), co-founder and co-chair of the Congressional Transparency Caucus, introduced the Communications Over Various Feeds Electronically for Engagement or “COVFEFE” Act. This bill codifies vital guidance from the National Archives by amending the Presidential Records Act to include the term “social media” as a documentary material, ensuring additional preservation of presidential communication and statements while promoting government accountability and transparency. 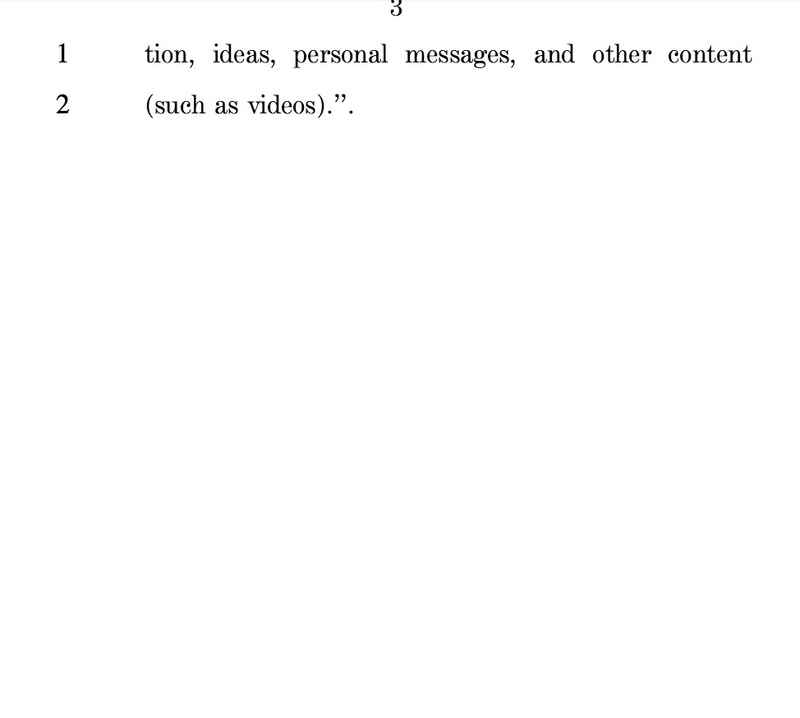 President Trump’s tweets frequently make national news and are a topic of everyday conversation, including deciphering the meaning behind his tweet using the previously unheard of term, “covfefe.” While his personal account has become the de facto account for government business, it is unclear as to whether or not it would be archived in the same manner as the official @POTUS account under the Presidential Records Act. Another concern relates to President Trump’s frequent deletion of tweets. 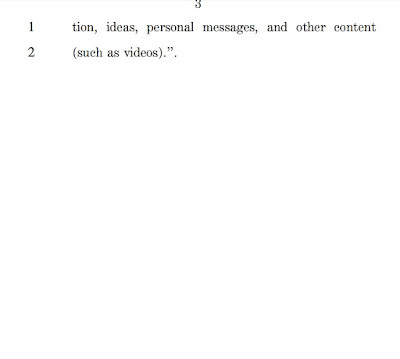 Including social media in the Presidential Records Act ensures that deleted tweets are documented for archival purposes, and makes deleting tweets a violation of the Presidential Records Act, subject to disciplinary action. 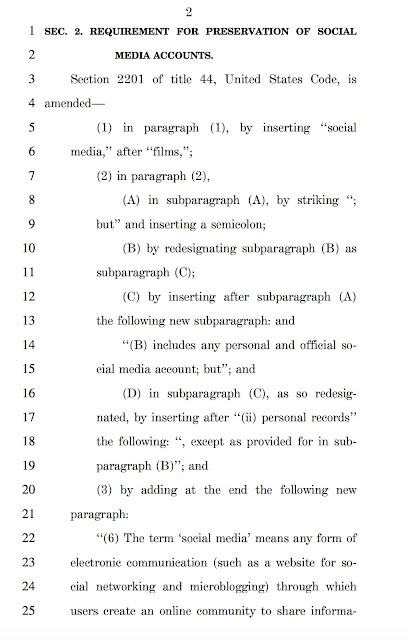 "Did President Trump try to 5D-Chess his way into a Bill that would make information posted on social media by someone else OTHER THAN TRUMP a criminal act to dispose of?" 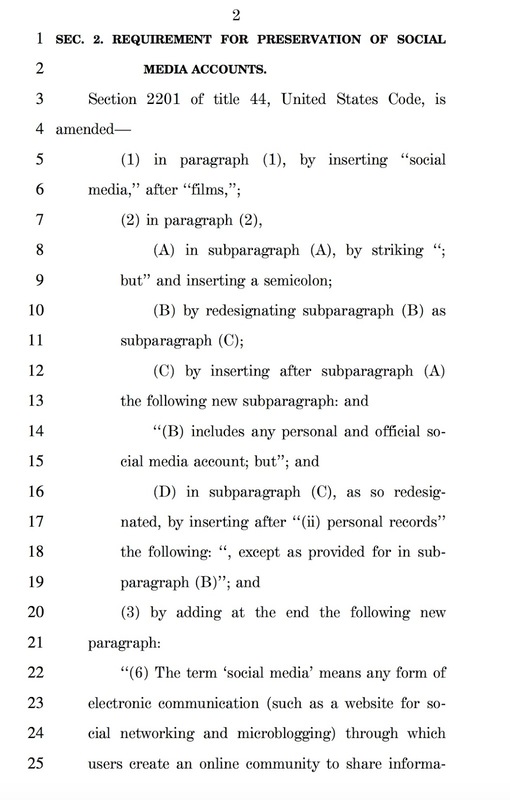 The COVFEFE ACT would actually be an amendment to the Presidential Records Act of 1978 which is already in place (USC 44, sections 2201-2207), which is an Act of Congress of the United States governing the official records of Presidents or Vice Presidents created or received after January 20, 1981, and mandating the preservation of all presidential records. The PRA changed the legal ownership of the official records of the President from private to public, and established a new statutory structure under which Presidents must manage their records. The only other such amendment was introduced in the house in 2007, and eventually appears to simply become Executive Order 13489 from President Obama in 2009. More about Representative Mike Quigley (D-IL-05): In Congress, Rep. Quigley is working to combat the Trump Administration’s recent efforts to roll back transparency. In March, he introduced the Making Access Records Available to Lead American Government Openness (MAR-A-LAGO) Act, a bill that requires the publication of visitor logs to the White House or any other location where President Trump regularly conducts official business, including various Trump Organization properties frequented by the president. Last month, he questioned the Acting Administrator for the General Services Administration (GSA) about the Trump International Hotel lease and possible conflicts of interest. Tennessee county holds ‘beeping’ Easter egg hunt for the visually impaired - Officials in Shelby County, Tennessee hosted an Easter egg hunt for those who are visually impaired.